Our thoughts on the future of voice interfaces. 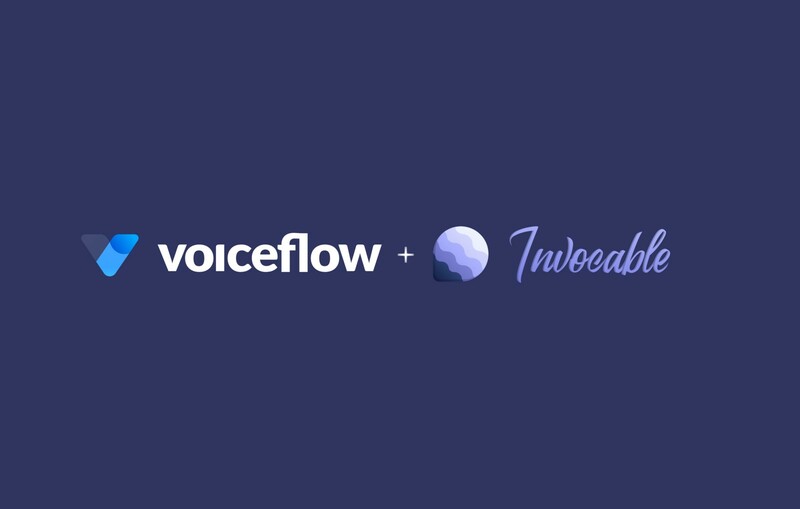 Today Invocable and Voiceflow are announcing our partnership following the news that Invocable will be shutting down their platform in July. We have been working with the Invocable team on this announcement since early January and wanted to offer greater context from our team, as well as our opinions on the future. Many of the best features of the Invocable platform will be carried over into Voiceflow. Our hope with this partnership is to get closer to our goal of building the industry standard platform for designing, prototyping, and building voice interfaces. 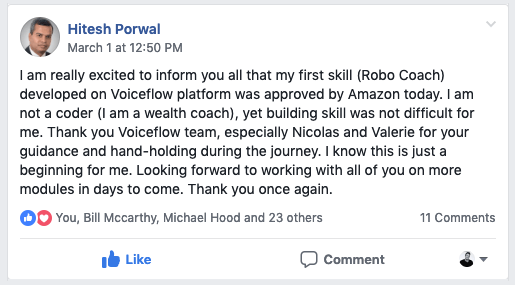 Before we dive in, some context on Voiceflow’s origin story. 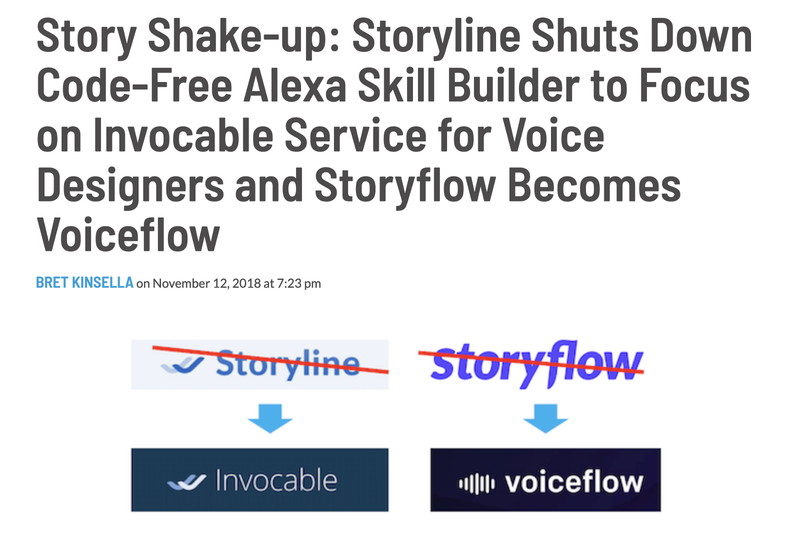 We got our start in voice building voice shopping apps, and eventually, interactive children’s stories on Alexa through a skill called Storyflow. For these early projects, we used Storyline (former Invocable name). We loved the Storyline product and it helped get us started when we had no funding or supporters. Below is a picture of our one-room office in 2018, building Storyflow, with Storyline. Months later, we became frustrated with technical limitations on Storyline. We wanted to build more complex projects to offer a more expanded and personalized user experience, and this is not something Storyline was focused on at the time. Storyline was the easiest way to build Alexa skills visually, but not the most powerful. We tried custom coding our Alexa skills for a month but it took too long and didn’t allow our team’s creatives to easily participate. We decided to build our own powerful tool, just for us, that had the power of coding, and ease of visual design. We continued to build out this internal tool until October of 2018 when we realized we had built a really special product that others in the voice community would find valuable. We shifted the company to become Voiceflow with the mission of empowering professional users to collaboratively design, prototype, and build cross-platform voice interfaces. This new product launched in November of 2018. Only a week later, Storyline pivoted to become Invocable — a total coincidence. The infamous “Story shakeup” story on Voicebot. Since our launch, we’ve helped over 7,500 people design, prototype, and build voice apps, from individual entrepreneurs to nonprofits to large enterprises on the front page of Amazon. We’re continually energized by the passion and creativity of our users. Every day there’s a new project which pushes the boundary of our platform, and it’s incredibly exciting. Our team believes in a future where voice apps are as ubiquitous as websites. We’re partnering with Invocable to aide in their transfer because we firmly believe in a future where voice interfaces are made standard across many applications, and people will need a platform to design, prototype, and create these experiences easily. Many of the innovative features designed by Invocable will be carried through into Voiceflow. There are already 2.5 billion voice assistants deployed today, and smart speakers are in nearly half of US households — making them the fastest ever adopted technology. For a second, imagine all these voice assistants as personalized search engines for services and information. If you’re driving home and thinking about dinner, you can have a conversation through Alexa to order from a local restaurant. Looking to book a vacation? Ask Google and they’ll connect you with the perfect 3rd party service. Many people ask us what the “killer app” is on voice, but we’ve already found it — it’s search. We believe voice apps are conversational nodes on these intention based search engines. Voice apps underperform today because they suffer from poor design and discoverability. Design can be solved through better VUI standards and design tools, while discovery is already improving as the platforms shift from explicit to implicit activation (asking for a skill by name vs it being recommended). We told Voicebot we believed Can fulfill intent would be the biggest advent of 2019 and we meant it. Furthermore, voice apps are treated as and compared to mobile apps when in all reality they’re conversational websites. Not every business needs a mobile app, but every business needs a website. Websites are not meant to be engaging the way a mobile app would be, but a way to have a conversation with consumers and tell the story of your brand visually. If someone asks Alexa about your business in two years, you can choose to not be found, have a stock one-liner response, or you can design your brand’s persona and conversation through a voice app the same way you would a Wix website. The day consumers begin to ask rather than type for a fraction of their intent-based searches (“I’d love to go to Rome” vs “How cold is it in Rome”) is the day the number of voice apps springs to new heights. Amazon and Google have made it clear this is the future they’re working towards. 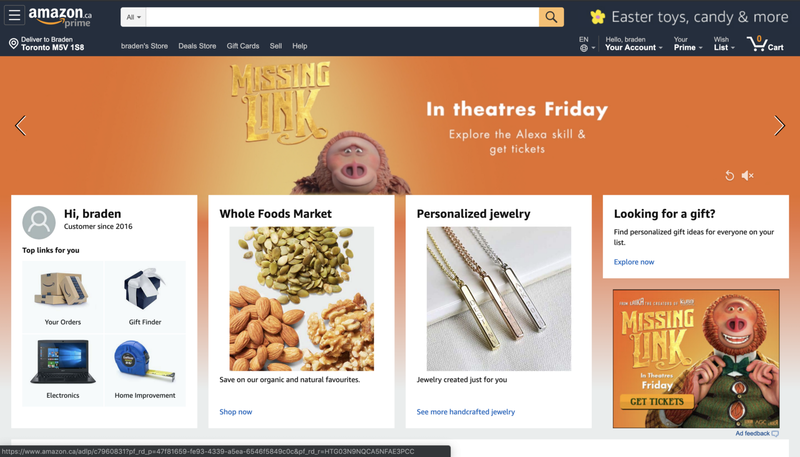 Alexa Blueprints and Dynamic Entities is making skill creation easy, and nearly automatic — similar to the web. This is not a move you would see in the world of mobile apps. Scathing, right? The first paragraph is the first usability study of early websites from 1994, the second from the early days of mobile in 2000, and the last a voice interface study from 2018. All I did was replace websites and mobile with voice apps. Voice interfaces will get better with time as our community solves design, and the platforms solve discoverability. As technology continues to advance at an accelerating pace and large companies compete over the future of voice, I wouldn’t be surprised if the future we believe in shows up a lot sooner. 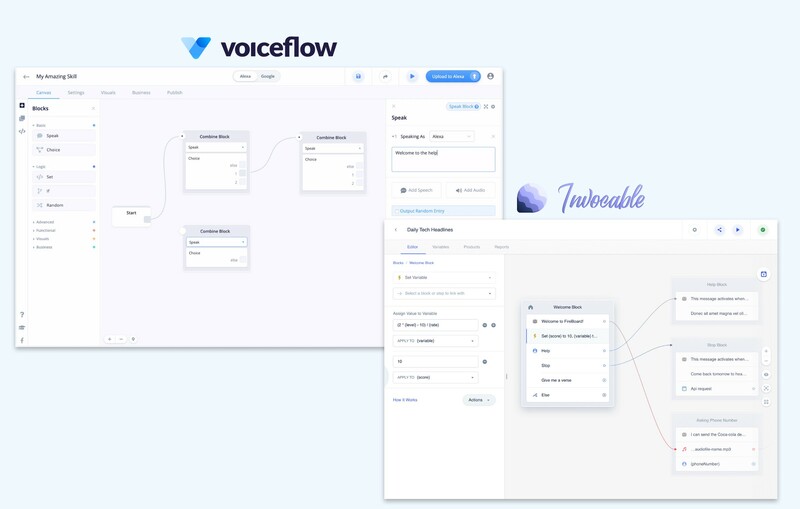 Over the next 3 months, the Invocable & Voiceflow teams will be setting up the migration of Invocable’s users to Voiceflow to create the next generation of voice tools. What happens to my live skills on Invocable? Invocable skills will continue to be hosted free, forever. They will be transferred to Voiceflow’s servers — without you having to change anything. What are the major differences between Invocable & Voiceflow? We’ve been working with the Invocable team and platform since January. Already, the platforms are quite similar. The only major differences for an end user today would be Voiceflow’s block system vs Invocable’s step system alongside Voiceflow’s powerful logic system. I’m paying for Invocable — what happens? You will receive an email from the Voiceflow Product Team to book a demo. We’ll do a 1–1 call with you to introduce you to Voiceflow, and how it differs from Invocable. You will get priority transfers for your Invocable projects which upon switching to Voiceflow will be completed within a couple of days. Your Invocable payments will stop, your most recent month will be refunded, and you’ll have the option to join 7,500 other designers & developers on Voiceflow’s $29/mo plan. If you paid for Invocable’s yearly plan upfront, you will receive the equivalent value of Voiceflow premium for the duration of the year — free of charge. Email Sales@Voiceflow.com to confirm this. How do I know Voiceflow won’t shift platforms? Voiceflow is venture-backed by amazing investors and supports dozens of large enterprise clients already — including the American Cancer Society, Isobar Agency, and the Guardian. We’re not going anywhere. Can I export my code off Voiceflow? Yes, you can soon. We believe this is fundamental to building trust with our professional users. We are actively building a way for Voiceflow users to export code from their projects to take elsewhere or host on their own servers. I have lots of questions — who can I contact? How do I access my Invocable skills? Voiceflow & Invocable are working together to build a skill transfer tool to make it easy to transfer projects you wish to keep working on from Invocable to Voiceflow. This is only necessary for people who want to access & edit their projects — live skills you do not want to change will not be affected. You can signup for the transfer tool here. A quick special thanks to Vasili, Maksim, and the whole Invocable team. You’ve helped lead the voice space and empower thousands of entrepreneurs, including ourselves, to get involved. You’ve acted with integrity and honesty throughout this long process and built something truly amazing. Thanks, and good luck on your new adventure! Conversations on voice & voice interfaces.